Promoting your business is never an easy task. Usually there is quite a lot of work involved and it can be extremely costly. Marketing and advertising can run into thousands of pounds for small companies and millions for larger corporations. If you’re thinking about promoting your business consider using custom printed microfibre cloths. Microfibres are extremely small strands of material that measure about half the thickness of a silk strand and can even be one tenth of a human hair in thickness. Microfibre cloths are usually made from nylon, polyester or a mixture of both. The resulting material is very lightweight & durable and is very popular due to its ability to pick up the tiniest of particles without the use of a solvent. I knew a business once that would send out a discounted postcard to all the businesses in their industry. No big thing you say? Hey, these days they would definitely consider sending out a microfiber cloth instead. I can guarantee people will be much less likely to throw them straight in the bin. Let’s say you sell computer equipment, including a branded microfiber cloth with your logo on it in every order you send out will get you a little kudos. Microfibre cloths are extremely handy, I can’t think of any work desk I’ve seen that doesn’t have one sitting around on it. Technology is everywhere and it always needs wiping down, the chances are, almost all your customers and potential customers will have a permanent use for any microfiber cloth that came their way. People don’t throw them away because they’re very useful for cleaning dust off monitors and other peripherals. Clever business owners are capitalising on this usefulness and printed microfibre cloths are being sent out more and more as part of promotional campaigns for many businesses and are a great little addition to any introductory package you hand out at a business event. 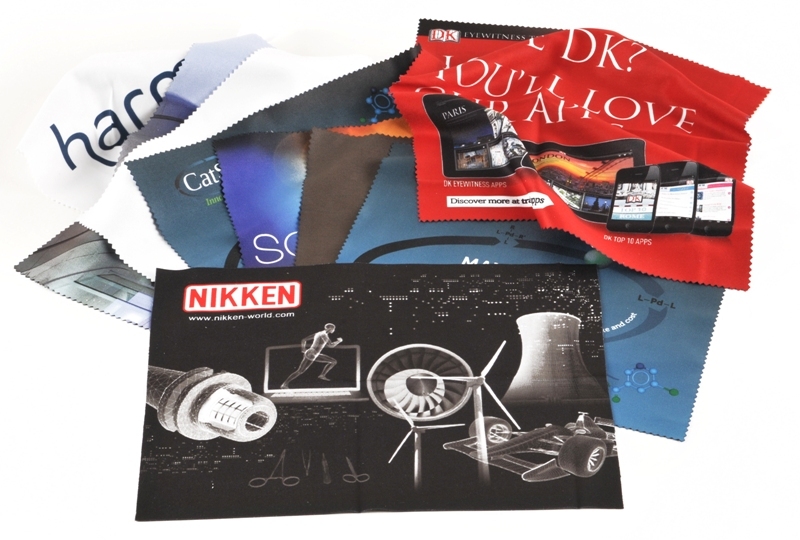 Microfibre Cloths come in a wide variety of shapes, sizes and finishes and printed on using a digital printing process. The digital printing process ensures your company logo can be replicated in extremely high detail. With modern digital printing processes, microfiber cloths can have full colour photographic quality images printed on them. 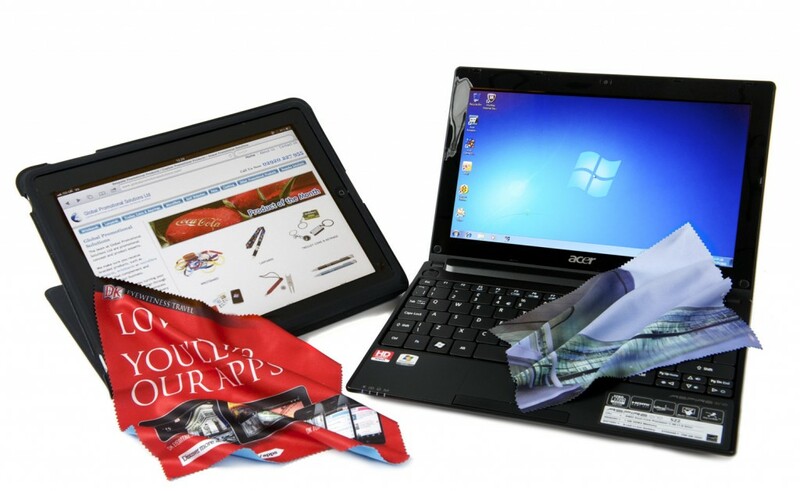 This can turn the microfiber cloth in a mini brochure for any aspect of your business you want to put forward. They are incredibly durable too, a typical printed microfiber cloth can last years, all the while advertising your business to the user and exposing your business to many more people besides. They can be washed multiple times with the print and your company logo staying perfectly in-tact. Microfibre cloths have a whole array of uses for both the home and in the office. They can be used to dust off all manner of electronic equipment and sensitive technology. Microfibre cloths for iPads are used extensively to clean the sensitive screens. They are used for polishing metal or glass surfaces and are known to be much better at these tasks then conventional dusters. People also use them to mop up liquid spills on account of their ‘super’ absorbency. So next time you’re thinking about handy little ways to promote your business and you’re looking for a long term investment strategy why not consider sending out printed microfiber cloths. They are an extremely useful, cost-effective alternative to pens, key rings and other promotional products and will enamour the user to your business for months or years into the future.